Scab occurs throughout the Midwest, wherever peaches, nectarines, plums and apricots are grown. The disease affects fruit, leaves and young green twigs. 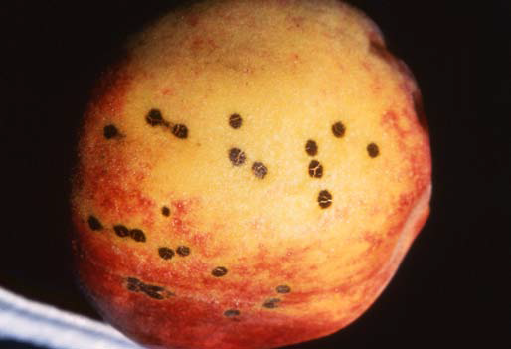 Scab is most common in home orchards where fungicide spray programs are not practiced. The general use of fungicides by commercial growers has greatly reduced losses from scab. The principal loss from scab is the unsightly spotting of the fruit skin, but premature defoliation and a dieback of infected twigs can also occur. Losses are generally greater on peaches than on nectarines, plums and apricots. Figure 1. Scab on peach fruit. Figure 2. Scab on peach fruit. Wet conditions during spring and early summer after petal fall are necessary for a severe attack by the scab fungus. The disease is usually more serious in low-lying, moist, shady areas where air movement is poor. Symptoms first appear on fruit when they are half formed to nearly full-grown, about six to seven weeks after petal fall. Small, round, olive-green spots about 1/16 to 1/8 inch in diameter develop on the fruit. Spots are most common near the stem end on the side of the fruit exposed to the sun. Spots are superficial and slowly enlarge. They may merge to form large, irregular blotches that turn velvety, dark olive-green or black. Severely infected fruit may be stunted, become misshapen, or crack open. When fruits crack open, they are often invaded by other fungi that rot the fruit. Scabby fruit may also drop prematurely and do not ship or store well. Leaves may also be infected by scab. Small (¼ inch), round, and yellowish-green to yellowish-brown spots develop on the underside of the leaf. Diseased leaf tissue may dry up and drop out, leaving “shot-holes.” If the season is wet, scab-infected leaves usually drop early. Scab is caused by the fungus Cladosporium carpophilum. The scab fungus overwinters in twigs infected the previous year. During spring and summer, large numbers of microscopic spores (conidia) are formed on the twig lesions. At 100 percent relative humidity, 20 to 30 hours are required for abundant sporulation in twig lesions. The spores remain firmly attached to the twig until they are moistened. When moistened, they are spread by splashing rain or windblown mist to developing fruit, twigs, and leaves. Spores are produced in the greatest numbers about two to six weeks after the shucksplit stage of development during warm, wet weather. Spore germination and fungus growth is most rapid at 65 to 75 degrees F. If weather conditions are favorable, infection begins to occur at about shuckfall. The fruit remain susceptible until harvested. Forty to 70 days elapse from the time the spore lands on the fruit until the disease is visible. Thus, the disease is usually not observed until the fruit are well grown. 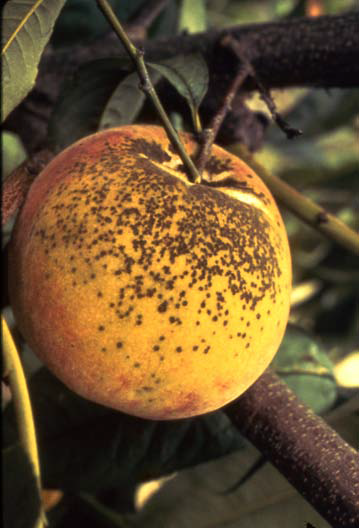 Spores from the fruit reinfect the twigs and leaves, completing the disease cycle. Figure 3. Peach fruit severely infected by scab. When planting an orchard, avoid low-lying or shaded sites with poor air circulation and soil drainage. Any practice that promotes faster drying of fruit and foliage will help reduce the risk of infection. Destroy nearby wild or neglected peaches, nectarines, plums, and apricots. Remove and destroy scab-blighted twigs before growth starts in early spring. Backyard growers should remember that infections are generally superficial. 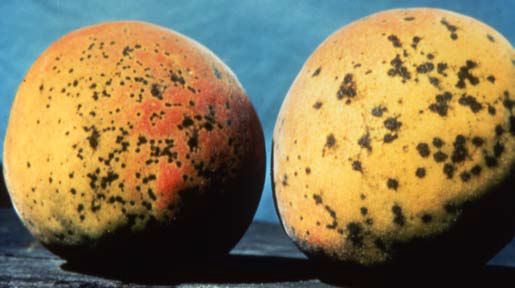 If infection is not severe, fruit quality is little affected. Peeling infected fruits make them quite acceptable for processing (canning or freezing) or eating fresh. For commercial growers, fungicide applications are an important means of disease control. Commercial growers are referred to Bulletin 506, Midwest Fruit Pest Management Guide. Backyard growers are encouraged to use cultural practices for disease control in order to avoid the need for fungicide use; however, fungicide sprays are an option. Backyard growers are referred to Bulletin 780, Controlling Diseases and Insects in Home Fruit Plantings. These publications can be obtained from your county Extension office or the CFAES Publications online bookstore at estore.osu-extension.org.